Post subject: Acoustic Treatment...is this okay? Hey guys! Okay, so I have my little rehearsal space, in which I've been doing some recording. So far everything seems fine. There are problems sure, and issues I'm working through, but so far I think I'm feeling pretty okay with all of this. My question is about the treatment on the inside of the room. I am in no position to drop any amount of cash on acoustic tiles or bass traps, but what I've done can be seen in the pic below. The tiles are 1/2 thick open-cell neoprene. I've noticed a drastic improvement in the sound of the room, which was sounding like the inside of a bouncing basketball, but I'm wondering...are my inexperienced ears missing something? Again...everything sounds "fine" to me, but I rarely if ever see this sort of symmetrical checker-board pattern I've implemented. So, what I'd like to know from some really experienced 'acoustic engineer' types... how #@$% up is my set up? I recognize, there are countless variables, and without being in the room, no one can tell me exactly what I need, but I'm looking for the theory, the probabilities, the 'hey watch out fors'.... Know what I mean? The room is 10x14x8. The walls are 1/2" OSB, about 50% of which is covered with 1/2" thick foam. The ceiling is covered in a loose, draping, heavy fabric similar to burlap, but thicker. Any advise or observations would be appreciated. Probably time for bass traps (calling Spishak! Calling Spishak!). Nice kit by the way! Looks good. At least 1000x better than the acoustics of my studio. Welcome to the forum, enjoy your stay. Check out the stickies in the announcement sections. I can't tell from here, but it looks like you're only using overheads and a mic for the kick drum... is that so? You may get some early reflection off the back wall... and your sound may be a little thinner than you would hope. Have you considered close micing your kit. In my uninformed opinion, you can overcome a lot of room acoustics when recording close mic'd - does not necessarily hold true when doing live sound. BTW... make sure you wear ear plugs! Welcome to the forum, ElGuapo. I can't give you much advice on room treatment, but the checkerboard pattern is something I've seen in lots of photos of both home and pro studios. 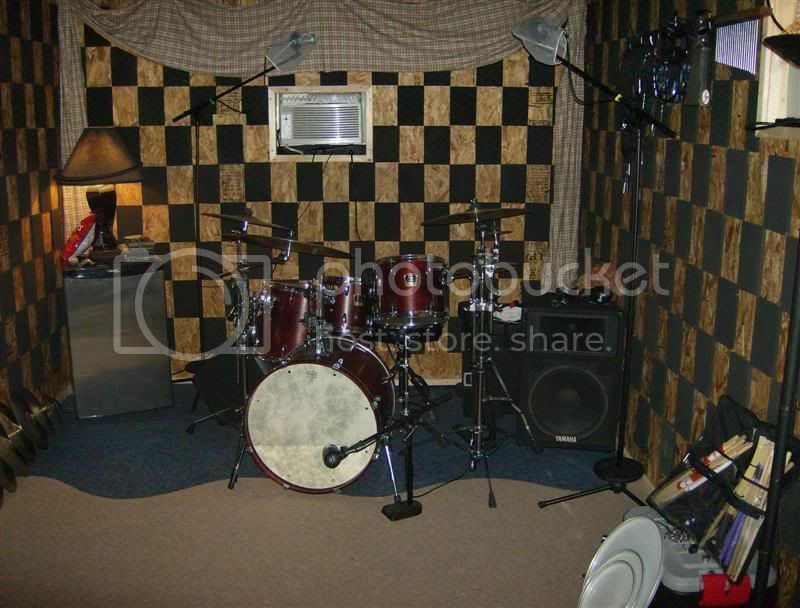 You might go to homerecording.com and post this in the "studio building and display" section. You'll probably get more in the way of informed feedback there, but you will most certainly have more fun here if you stick around. Hola el guapo. Como estas y bienvenidos. The real test is in the sound. Can you post some clips so we can have a listen? I might be concerned with the room being too dead. When you use a minimalist miking technique, the room sound comes into play much more than when you close mic every piece of the kit. I use a 4 mic technique (kick, snare & 2 overheads) with decent success. Thanks Painter. I have some super thick 2" neoprene I may fashion into effective traps if necessary. Without much experience, I can't really tell. Thanks Robbie. Are some of my question already covered in the stickies? CindaP - I almost always wear ear protection. Yes, I am using two overheads and a kick mic. Actually...the sample I've provided, is with just the overheads. I Own 15 mics for this set...toms, hats, snare reso, etc,, but in such a small room it's really not necessary...I don't think. To my ears, the room sounds pretty alright. I attribute any flaws in the recording to mic placement, tuning, signal-processing, and a lack of experience. Thanks JM. I've been to Homerecording.com, and yes...I think this is more for me. Bartman - the room is far from dead, but not exactly 'live' either. My drums are wide-open...no muffling...anywhere. The degree of dampening on the walls seems to work well for my very lively drums. So anyway...here's a 2min clip of me playing. The recording was done in the room pictured. using only the two AT3035 LDC's. The Beta52, was not used. No EQ, no mixing, no processing...raw tracks. Based on the wav, I'd second Cinda's suggestion and close mic at least the snare - while I like the openess of the overall sound I want more presence and definition in the snare, so your complicated and nuanced ruffs and ghost notes stand in higher relief in comparison to the toms and cymbals. Otherwise, I can't quite tell if the echo-y quality of the recording comes entirely from the tautness of the drumheads (you tune your heads much higher than I tune mine, which is to say I keep mine a pinch above limp) or from the reflective qualities of the room. Based on what I know about acoustics, the checkerboard pattern is probably great for cutting down on the liveliness of the mids and highs, but the lows need those traps. Maybe consider building a curved diffusor out of plywood to deal with the fact that the walls (treated or not) are parallel. Check out this guy's website; he's the man. Feel free to ignore any or all of my comments. You are a very talented drummer, by the way. Thanks man...no I won't disregard any advise....it's why I'm here. The 'echo-y' quality you speak of(it's a real word if we both us it), is probably the drums...mostly. Like I said...wide open...single-ply heads. It's interesting that you feel the snare needs more presence. I feel it's almost too high in the mix. But, see...I guess that's because much of what I'm hearing, I can compare directly against the acoustic sound...seeing as I'm sitting right here with the drums...know what I mean? I guess that also makes it difficult to evaluate the sound objectively, because consciously or not, I will be referencing the natural sound of the drums...my expectations. Do you think the cymbals may be a little high in the mix? If so, this is something I'd like to fix in my playing rather than with mics. I want the recording to reflect what I hear...what drums sound like as you sit 2 feet above them. Is there a reason you suggest bass traps...what are you hearing that I'm missing? To me, the recording needs more bottom, but I figured it's because I was just using overheads. Do I not understand what bass traps do? Is there some muck in the mix my virgin ears can't hear? Oh..this is important...I have no monitors worth a crap. I'm mixing and/or monitoring through Shure E2c's...crappy little speakers that came with my computer...and Yamaha S115IV's. Yeah, I know...please don't scold me. I'll get some decent monitors before long. EDIT: Ya know..as I listen back through...you're right...the toms and cymbals are a little high in the mix. The snare could use a little something. Do you think this is something I could fix with some judicious compression and EQ? I really like the idea of keeping my mics to a minimum, but you're right...many of the ghost notes are lost. I guess they seemed more prevalent to me 'cause I knew they were there, but if you step back for awhile an reevaluate the sound, yeah...kinda lost. Thanks guys. This is the stuff I need. I would say keep your current mic setup, but add a close mic on the snare. Mix as you normally would, and then gradually add the snare mic in, just to give a touch of oomph to it. It's not that I want it neccesarily higher in the mix (i.e., louder relative to everything else) but I want it a bit more present. Part of giving it that presence is taking it out of the ambiance of the room a little and giving it it's own individual place in the mix. I like your goal of trying to recreate what you hear on the throne - I don't like the sound of over processed, overly cleaned up drums that you hear in most popular music. I like a little dirt on it, so to speak. But sometimes to achieve this you have to mix toward what you think you hear more than what you do hear. And this means giving a little more center stage to your fantastic snare figures in this case, I think. As for the bass traps, they serve to give the room a controlled sound by eliminating alot of the unwanted low frequency reflections that either add up to make a "boomy" sound or cancel each other out to create a "thin" sound, depending on where you place the mic or your ears. They would probably actually give your drums more bottom while also giving them a more precise sound. The same delecate approach to close miking the snare might help give you more power in your toms. As for your cymbal technique, I like it and don't feel it needs to change. I'm sure you would modulate the intensity to fit the song, but I prefer to hear a confident, hard hitting drummer myself. Can't wait to see what you come up with, buddy! Nice playing and a decent drum sound. The sound is a little distant to me. Try lowering the overheads a bit (a foot or 18" will make a huge difference). When you do this you need to play lighter than usual on the cymbals. I went back and looked at the photo and noticed what looks like a reflective surface in the left corner. What is that? Is it a stereo rack with a glass door? It might be the source of some problems. I hear reflections and reflections tend to rob clarity. Regarding the snare.....if you are playing a rock tune you will need to mic it and make it more dominant in the mix. If you are going to play jazzy or softer acoustic rock like Jack Johnson, the sound you have now will probably work. Tomorrow morning I'll post a clip of a simple rock tune I recorded over the weekend with a 4 mic setup. No, but it'll tell you some more about the background of this forum, as well as what it can do for you and how. I am posting a ~ 1 minute segment of a simple rock tune I tracked this weekend. PJ Drums Only is a stereo mix of the kick, snare and overheads. PJ is a stereo mix of drums, scratch guitar track and scratch bass track. El Guapo - I hear two primary differences between my drum recording and yours.....1) a more up-front kick and snare on mine and 2) a less distant overhead sound on mine. Again, depending on the type of music you're making, the drum sound you have may be ideal. I think the sound you have now would work great for jazz. The kick and snare sounds IMHO wouldn't work for a rock tune. If you are interested, I can share what I did to get the kick and snare more up-front. I'll listen tomorrow... if I get the chance. Sounds good Bartman...nice and clean. I see what you mean about the more distant sound opposed to your tighter sound. I think a more appropriate sound for me, would be something in between. I still prefer an overall 'live' sound, and I don't want too much isolation between instruments. This is however...coming from a drummer's perspective, not a recording engineer. the silver object you see in the l/h corner is the beer fridge. We're not going to @$#% with the beer fridge. But...there are other things...like that row of cymbals along the wall...they go all the way around about 14 feet. So yeah...they need to go back in their cases. The door, which you can't see, and measures 4x8, is not treated, so I'm sure that's bouncing some air around. But...I still don't 'hear' the reflections you speak of. I mean...I do hear very resonant drums, lots of vibration and brilliance, what some might characterize as "noise". I hear squeaks, pops, farts and groans...all the things a drummer hears back there. I hear a need for compression, clarity, equalization, and some issues with overall balance. What I don't hear...and this is probably due to inexperience...is phase issues, standing waves, and all the crap engineers hate. Now from an academic perspective...this is a very amateur recording...no doubt. I have a lot of refining to do. It'll start with proper monitors. For now, all I'm trying to do is get the room sounding acceptable. To me...it does sound acceptable...and that's the problem. So Aside from sounding too 'distant' and lacking 'clarity'...is there something specific about the sample that says...whoah, you need bass traps, or is this just a given? Keep in mind...the drums are wide-open, and for me "should" be that way. My playback abilities however, are limited, so what I hear as "nice bottom end"...better equipped guys may be hearing as booming or muddy. I'm a beer lover too so no push back from me.... but you are getting reflections off it. But...I still don't 'hear' the reflections you speak of. I'm not a recording engineer, or a drummer or one of the better mixers in this forum, nor do I profess to have a great ear for sound......but I will tell you this, I hear sound bouncing around in that room. Do a little test. If you are able, apply a different short delay to each of your three tracks. Mix it down and compare it to your original mixdown. You don't need to be an expert mix engineer or sound treatment expert to know drum kit strikes bounce off reflective surfaces. When those drum strikes are close together (ie:complex playing), you hear an echo or reflection) on top of the next drum strike. It robs clarity. I mean...I do hear very resonant drums, lots of vibration and brilliance, what some might characterize as "noise". I hear squeaks, pops, farts and groans...all the things a drummer hears back there. I hear a need for compression, clarity, equalization, and some issues with overall balance. What I don't hear...and this is probably due to inexperience...is phase issues, standing waves, and all the crap engineers hate. Now from an academic perspective...this is a very amateur recording...no doubt. I have a lot of refining to do. It'll start with proper monitors. Your drum kit sounds good, the performance is very good and I think the recording is way better than you givce yourself credit for. I don't hear a need for much compression on your recording except to bring out the kick. If you compressed those overheads, I bet the roecording would sound worse. Equalization? Sure. Balance, yes. Pull the overheads down a foot or so. Your playing dynamics and balance are very good from what I hear. Proper monitors? Oh yeah, me too. You can't properly mix what you don't properly hear. I'm told bass trapping always helps, but go read Ethan Winer's web site to get the science behind bass trapping. I don't hear boom or muddy. I hear reflections. The real bottom line is this.....If the recording sounds acceptable to you and you like a wide open sound, I'd say mission accomplished and no worries. Isn't that just a sign that theres not enough beer in the fridge? B.B.King - "Playing the blues is like having to be black twice - Stevie Ray Vaughan missed on both counts, but I never noticed."